Commercial Quality Stainless Steel Construction. Non-stick rollers rotate 360 degrees for even cooking. Indicator light to let you know when the rollers are heating up. 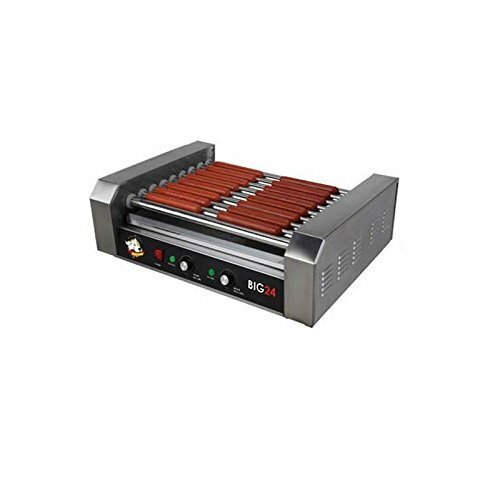 Dual temperature controls: Cook hot dogs on the front rollers at a higher temperature while keeping hotdogs warm on the rear rollers. Uses any size hot dogs from franks all the way to stadium dogs. Cooks a variety of foods including franks, sausages, hot links, and even breakfast sausages. Removable and easy to clean stainless steel drip tray. Rubber skid-proof feet for tabletop use. Simple control panel controls heat settings & on/off switch. Built-in fuse for safety. Assembly Required. 24 in. L x 16 in. W x 10 in. H (18 lbs.). Dimensions: 16L x 23W x 16H in. If you have any questions about this product by Roller Dog, contact us by completing and submitting the form below. If you are looking for a specif part number, please include it with your message.